Great image, love the soft colouring. love this Sylvie. 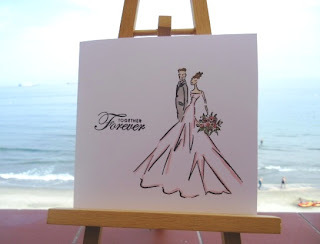 Great Wedding card, I really think you are doing brilliantly with the CAS style. As Carol says please send some sunshine. Beautiful wedding card Sylvie and I spy lucky people in the sea!! Beautiful card Silvie, gorgeous image. Gorgeous card Sylvie, this stamp really suits the less is more style. So elegant and so skillfully coloured. Super Sylvie... it's been hot in Spain this last week hasn't it! Sorry we didn't get to Gib! Elegant and lovely card ! Love the image ! Oh this is gorgeous Sylvie and now I really need that stamp. Sylvie, this is such a lovely card. I love that image, and the balance on the card is perfect. This is such a lovely stamp. Love your CAS card. A beautiful card and so stylish. A beautifully stylish and elegant card another beauty from you. Love this card, so stylish! Gorgeous, perfect elegant wedding card!